Like many a Canadian kid, Stephen Smith was up on skates first thing as a boy, out in the weather chasing a puck and the promise of an NHL career. Back indoors after that didn't quite work out, he turned to the bookshelf. That's where, without entirely meaning to, he ended up reading all the hockey books. There was Crunch and Boom Boom, Slashing! and High Stick; there was Max Bentley: Hockey's Dipsy-Doodle Dandy, Blue Line Murder, and Nagano, a Czech hockey opera. There was Blood on the Ice, Cracked Ice, Fire On Ice, Power On Ice, Cowboy On Ice, and Steel On Ice. 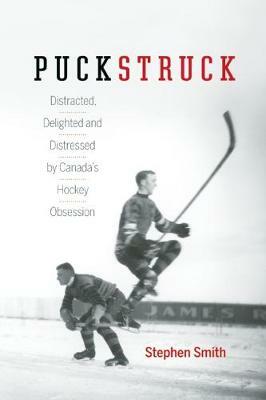 In Puckstruck, Smith chronicles his wide-eyed and sometimes wincing wander through hockey's literature, language, and culture, weighing its excitement and unbridled joy against its costs and vexing brutality. In exploring his own lifelong love of the game, hoping to surprise some sense out of it, he sifts hockey's narratives in search of hockey's heart, what it means and why it should distress us even as we celebrate its glories. On a journey to discover what the game might have to say about who we are as Canadians, he seeks to answer some of its essential riddles.